My Friday night vice: an extra dirty martini. I feel like the consummate 1960s housewife when I have these at home. But not at La Cave with KROB. Are you serious?? Are the similarities between us ever going to stop?! I think we are going to be learning about things we have in common in the nursing home! 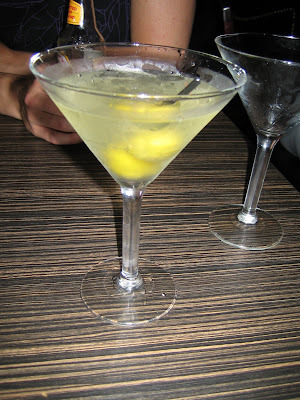 I love an extra dirty martini (I especially love when it tastes like straight olive juice!). Nothing beats it! We will have to have a martini date!